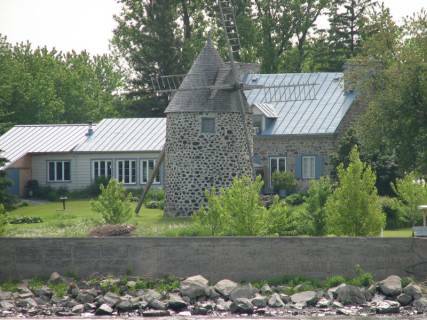 Trois Riviere, Quebec. Friday, June 2, 2006. We were delayed one day in Montreal due to thunderstorms; the weather forecast was for NE winds, but light enough that we could handle the wind blowing from the NE against the current flowing to the NE. In fact, the wind was hardly a whisper for the entire 70 miles. 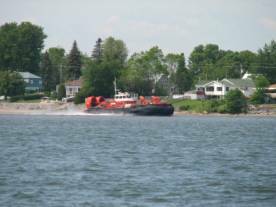 We were thrilled “shooting the rapids” around Pointe du Havre (the ones we struggled with going upriver to the marina on Wednesday) and reached an amazing 11 knot speed. 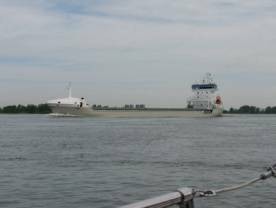 We were awed by the variety and size of the commercial ships, especially the container ships, and were really happy we did not have to pass an upbound and downbound freighter at the same time. 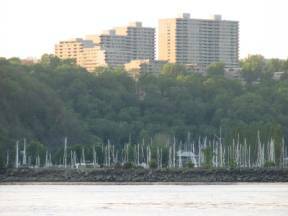 The channel is wide, but not for multiple large boats. 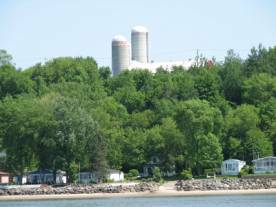 The countryside is dotted with small towns, church spires and silos. 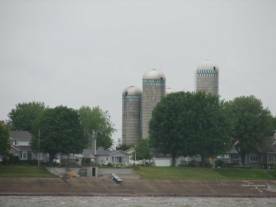 The communities on the north shore are so isolated from those on the south side since there are no bridges from Montreal to Trois Rivieres, and only one ferry at Sorel. We saw several old-generation wind generators: Stone towers with four large arms. 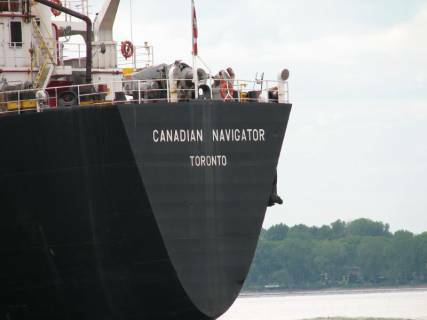 As we approached Trois Rivieres, the freighter Canadian Navigator passed us going upbound. 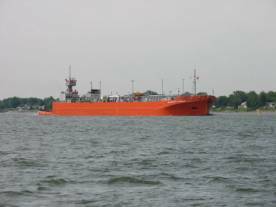 If you followed our 2005 adventures, you may recall we spend many hours in the Welland Canal with this cautious, slow boat. 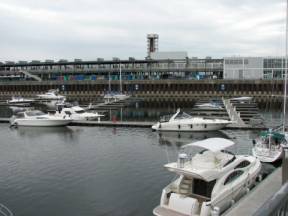 Our plan was to stay just one night at the marina in Trois Rivieres. Saturday morning the forecast was for NE winds, 15-25 knots, which would make the trip to Quebec City difficult. 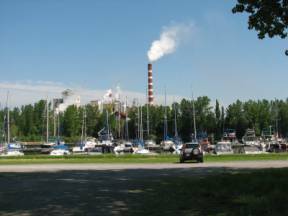 However, the wind in the marina was light, and we thought the forecast could be incorrect. We left. We were making reasonably good time despite the waves caused by the wind blowing against the current. 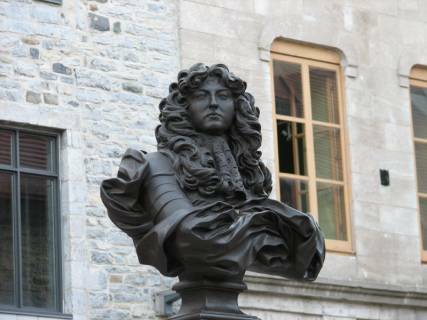 However, as we approached Deschailions-sur-Saint-Laurent, a turn in the river a few miles before the Richelieu Rapids, the wind suddenly swept down the long riverbed at full force, 25 knots, and the waves built to 5-6 feet. 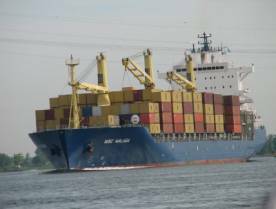 A freighter also passed us going up the river. The combination of wind, current waves and boat waves caused us to stop dead in our tracks. 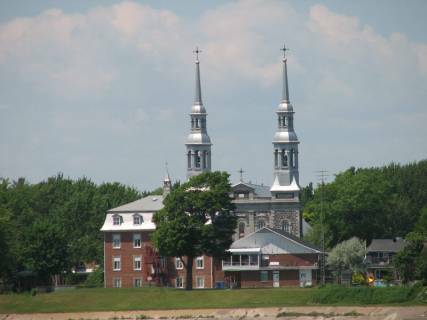 We turned back to Trois Rivieres. 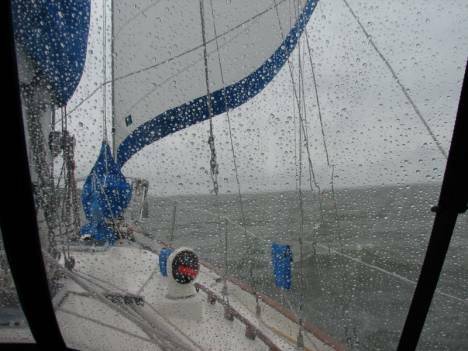 Since we had a strong wind at our back, we unfurled our genoa (sail) and made relatively good time against the current. 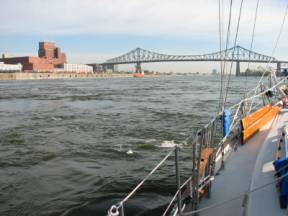 The wind continued strong from the NE all day Sunday, and finally on Monday morning lightened and turned to SW. We motored all the way to Quebec City with no problems. Two incidents of note, however: when we reached the bend in the river where we turned around on Saturday, we encountered waves, about 8-12 inches that lasted for about 1 mile. 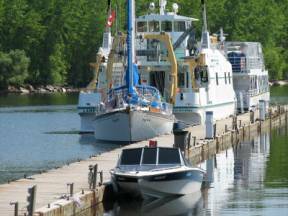 Even in dead calm conditions, the tidal currents and river currents seem to cause a disturbance. And a little further down the river (at 46-33.887W, 072-03.703N) we were startled by loud music. It took a few moments to recognize the Canadian national anthem, “O, Canada”. 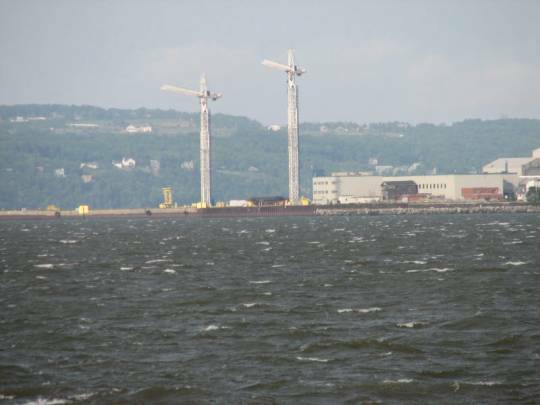 There was a huge flag on top of the south shore embankment and rock-concert-sized speakers. We understand from friends that whenever a pretty boat passes, especially a sailboat with its sails up, the boat is serenaded. 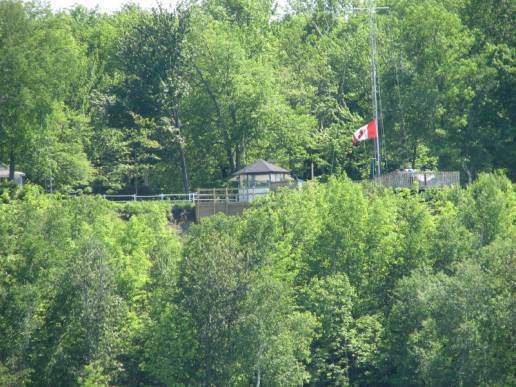 Let’s see … a big Canadian flag at half mast, a loud “O, Canada” … think they might be Federalists? 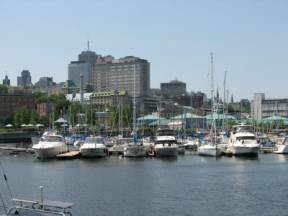 We arrived at Quebec City at dusk and headed for Louise Basin. The outer basin is at tidal level. 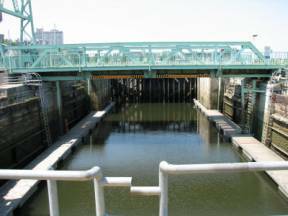 A small lock raises / lowers boats to the inner basin level, so that boats at the marina need not worry about the tides when at dock. 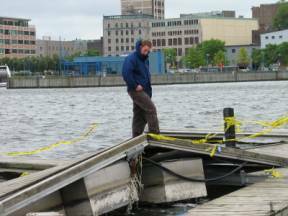 There was a bit of confusion about our dock assignment. We heard “K4” but they were saying Quai (dock) 4. Most of the people we have met in shops and the marina have difficulty conversing in English, but their English is much better than our French. 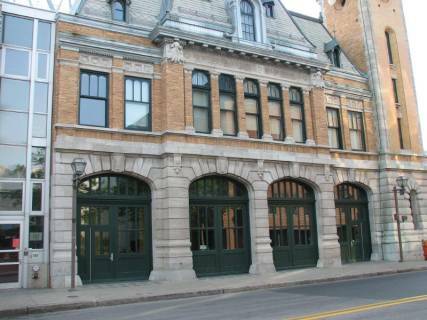 Thank you, French Canadians for speaking English. 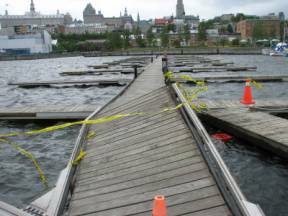 One of the docks at the marina had been blown out during the storm we experienced in Montreal. They were still being salvaged during the storm when we were at the marina. 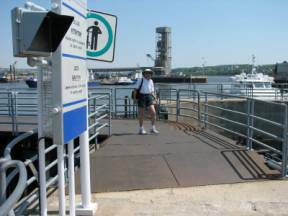 Fortunately, it is still early in the boating season and there was space for us to stay for an extended period why the weather settled. 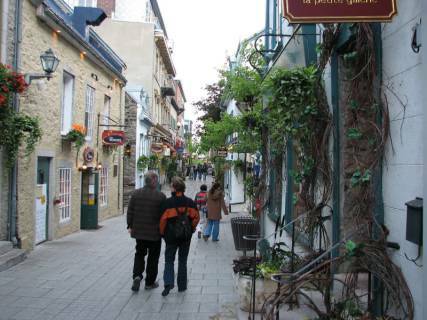 Quebec City includes the only walled city north of the US/Mexico border, and has the charm of 17th and 18th century France. 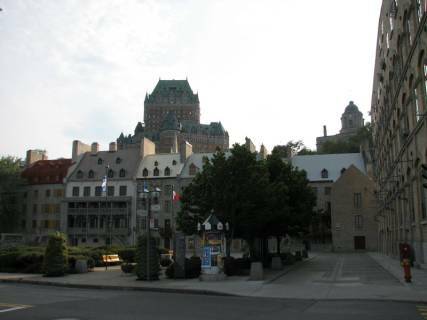 The most famous / most photographed hotel in Canada, the Frontenac high on the embankment over the St. Lawrence River. 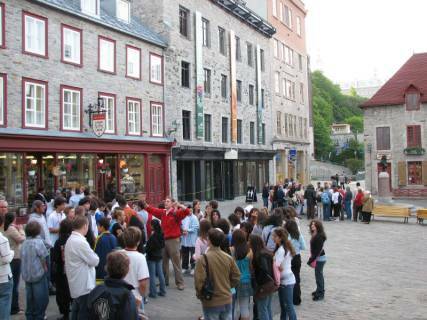 June is the month for school trips to Quebec City. We hope to dawdle through the next 150 miles, and probably will not have access to the internet for updates until late June. We are still having fun, despite the “setbacks”. Once you realize you are traveling on God’s calendar, these setbacks are just opportunities to meet new people, have new experiences, and learn.